Learn about the Hawks Hall of Fame. Am I eligible for nomination into the HACC Hawks Hall of Fame? Have a high level of success as a HACC athlete. Have participated in HACC athletics for two seasons. Pass a minimum of 30 credit hours at HACC with a minimum GPA of 2.0. Eligible students must have not been a HACC student athlete for at least 2 years. An extremely successful season. It must attain at least regional, possibly national success/championships. Success at least three years before the award date. Cannot be currently working in the Athletic Department, except current coaches. Do not need to have been a student-athlete at HACC. Need to make an outstanding contribution or be exceedingly successful within HACC Athletics. Download a nomination form (doc). Submit it to the Director of Athletics. Who are the 2015 Hawk Athletic Hall of Fame inductees? 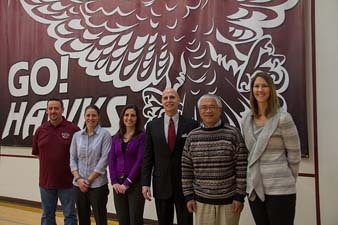 Who are the 2014 Hawk Athletic Hall of Fame inductees? They were honored during HACC's men's basketball game halftime on January 18, 2014. The 2014 Hall of Fame class pictured with Dr. Ski and their nominators. 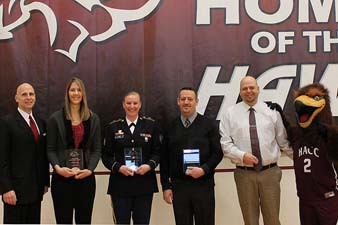 Who were the 2013 Hawk Athletic Hall of Fame inductees?